Located 17 km outside of Siem Reap is the Tonle Sap Lake, the largest freshwater lake of Southeast Asia. An abundant fishing lake with murky brown waters, it’s home to crocodile farms, mangrove trees and farms a variety of fish, which feeds about half of Cambodia. The biggest attraction for tourists however, is that it harbors communities of floating villages— boat houses to houses raised upon stilts up to 10 meters high! Why are the stilts on the houses unusually high? The phenomenon around Tonle Sap Lake is that it changes directions twice a year. Fed by the Mekong River (floating market post here), during summer’s wet season, the river can grow 20 km beyond it’s normal size and anywhere from 2-10m deep. During dry season, it reverse direction, making the stilts make the houses look like towering cranes soaring overhead. 2 Boat scams to Tonle Sap Villages: How much does it cost? 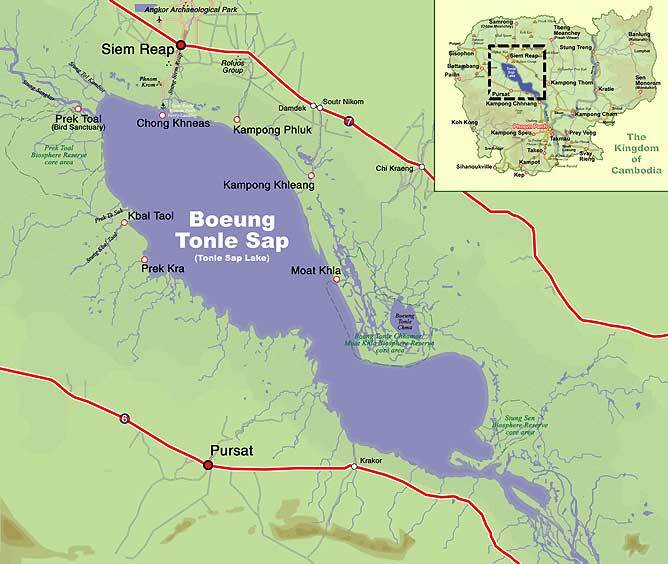 The three noteworthy villages are Chong Khneas, Kampong Phluk and Kampong Khleang. While Chong Khneas is mostly Vietnamese and a tourist trap. Although it may not be the most picturesque, it’s the closest to Siem Reap, which makes it a easy day trip for tourists. A two hour boat ride leaves from Chong Khneas dock and costs around $10/person. Meanwhile, Kampong Phluk (read Jack & Jill’s travel adventure here), mostly Khmer, consists of three villages. The villagers’ homes are comprised of stilted houses raised about 6 meters high. Surrounded by mangrove forests, during wet season residents live in their stilted homes, but when dry season rolls around and houses are far from the ground, residents build temporary floating homes on the water. Lastly, Kampong Khleang sits 35 km southeast (and the furthest) from Siem Reap. There, houses are raised to 10 meters and the population is 10 times that of Kampong Phluk, making it the largest community. Boat scams to Tonle Sap Villages: How much does it cost? I joined a small group of travelers and our tuk-tuk driver dropped us off at the Chong Khneas dock. The boat price at the admission office was almost tripled to $35 per person. Whah? That didn’t feel right. The Siem Reap Angkor Visitors guidebook that I picked up at my guesthouse, quoted $10. A scam. But the dock’s box office looked so legitimate and it was the only way onto the dock. Our tuk-tuk driver seemed reluctant to take us anywhere else or help, so we knew he was in on it too. So we told him to take us further down to another boat dock, where we saw a uniformed security guard (or policeman) and asked if what we were given was the normal price. He frowned. He said he’d personally accompany us back to the dock to look into the situation, which made our tuk-tuk driver even more uncomfortable. When the men at the dock saw the policeman, the price deflated to something more reasonable. Whew. Ironically, I read (at Tales of Asia here) that the police actually run this tourist boat op, so maybe the policeman we brought along with us was some other authority or heavy. Apparently there’s a few more scams than I know about . Read about City of Dust‘s interesting experience here. What I love about travel is the opportunity to see off-the-beaten track lifestyles. I’d not seen anything like this since the floating markets of the Mekong Delta in Vietnam. The notion of living on a riverboat house is intriguing but, living in a community, where everything is done on the water blows my mind. People in these floating village communities make a living off of what the lake provides- fishing, boat making, shrimp farming, crocodile farms, etc… They wash, bathe, swim and fish for dinner in it. It’s a fully-functioning community with watery streets, boats in the place of cars, floating schools, markets, hospital clinics, a generator for electricity. I hear there’s even a floating police station. I particularly loved looking at the houses. Many of them are open (I suspect for cooling), so you can see directly inside into the living rooms, which all have their unique family designs. Many of these boat houses seem to be one or two room dwellings with scant furniture. My boat stopped at a resident crocodile farm so we could get refreshments, buy souvenirs or snap photos of the crocs (…and a little girl, who wraps herself with a long river snake). The place seems mostly for tourist attraction however. The crocs are so motionless, you’d think they were plastic. Next question: are there crocodiles in the lake? Uh… I hear not (at least not in Chong Kneas). I hear its crocodile free, due to the fact they’ve all been hunted for their skins and exported off to Italy. So you’ll see children and adults swimming and happily splashing in the lake. There still are very, very small numbers of wild crocodiles in the lake, but they are almost exclusively in some nearly inaccessible swampy areas along the northern shore. These are almost certainly Siamese crocodiles, although at one time (probably more than 60 years ago) the very dangerous saltwater crocodile also inhabited the lake. Their lives make me more grateful for what I have. @Juls: That’s a perfect way to put it! I agree. Also, when I look at the simplicity of their lifestyle I also feel like I probably don’t need as much as I think. Wow, what a different way of life! I can’t really think of anything comparable in our society. People might live on boats occasionally, but to have the entire town on houseboats? There’s something a little romantic about that. I was thinking about going to Cambodia this summer. I’m super interested in taking those boat rides. I can’t believe you guys were being scammed. How terrible! Thanks for the heads up. I’m a sucker and always trust in people, so I have to re-evaulate my trustfulness with people…I guess that’s the right words. I don’t know, but you know what I mean. Still trust people, but listen to my gut. On a random note, I participated in the Liebster Blog award and I award you! I totally understand if you don’t want to participate, but I just wanted to let you know that I love and appreciate your blog (hence the award). @Jen: I’m honored you nominated me for the Liebster Blog award. I’m so back blogged, but I’ll see if I have time. Cambodia’s super chill so I highly recommend it. That boat scam was the only sketchy thing I experienced.